Since the monumentation date is "UNK", then the date on the disk becomes the monumentaion date as also shown by the Official recovery logs. I would say it is a First to Recover. You needed to be signed up by the start of the contest to be able to win a prize. Sorry you missed out on this, but there may be another contest in the fall. Just for asking this question, you're going to get a "Dreaded PM from John"! Making me think so hard after just getting back from vacation! It's a First to Recover as near as we can tell. Unless the Reference Marks have their own PID#, they are not considered the Benchmark Station. Therefore, you need to find the disk with the Triangle in the center of it. Since 1938 there may be considerable compost and debris that covers the station disk. It would not surprise me to have the disk be under 6 or 7 inches of mulch. Good luck with the hunt for that mark. True Value rents out metal detectors, or another BM hunter may be willing to go along and help out on the search. Harry has spent a few weekends searching for rivets in sidewalks. He will have to live vicariously enjoying the benchmarks that the TwoOldFarts have found on their vacation! Where have you been? What have you seen? Enquiring benchmarkers want to know! Really, we have been to the AZ, NV and CA deserts, and saw lots of desert with 'desert like stuff'. We also met a retired milatary surveyor that asked us if we were with the 'Gov.' and then talked about land surveying and in the same area an 'Gold Prospecting Assoc. of America Member' that asked us if we knew where the GPAA claim was....This was way out in the boonies - on a little one lane dirt road, called "Road to Greg's Hideout". We had a great time and drove many miles. John- thanks! After todays fruitless search for things that are probably long destroyed, it's good to have at least one win. The weather, however, was spectacular. I've failed to do this after my first question, won't do so after this last . . . Thanks for the patience and answers to the questions this benchmarking newbie has posted. The hunt goes on. For those in the contest, & those who may not be familiar with PMs here is a picture showing where to look to see if you have a "PM". This is a picture of the upper right corner of the forums. We had a very exciting moment today, our first "found destroyed", that is, disk intact but the mark is clearly destroyed (laying on it's side). I'm going to be working the NGS paperwork on it. Now, we found it, and you can read the disk, so I'd think that counts as a recovery (recovered destroyed?) for the purposes of the contest. I'd like to verify that's correct logic. I'd like my 2 points for this mark. "Recovered in Destroyed Condition" Ca-ching! Yes - that counts for points in the contest according to what year it was monumented. Looks like I found another interesting case. The first is a triangulation station set in 1934, and later destroyed. One of it's reference marks was "promoted" to be the new station, and is the second PID. The reference mark is stamped 1934 since that's when it was put there, but it wasn't surveyed and given a PID until 1958 (in the second data sheet). So if I go out next week and find it (as described), I can't log 2479 as found (station destroyed). I can log 2480 as found, but can I get 1934 points (when it was put there and the stamping) or 1958 points (first survey for that point)? You get 1958 scoring since that is the Official monumentation date. RZ1659 - "THE STATION MARK, STAMPED WHITE USGS 1945, IS A BRONZE STATION DISK SET IN A BOULDER ABOUT 16 INCHES BY 24 INCHES, AND PROJECTING 6 INCHES ABOVE THE SURFACE. THE MARK WAS SET IN THE LOCATION OF A CROSS ON THE ROCK MARKING THE U.S. GEOLOGICAL SURVEY TRIANGULATION STATION WHITE." Since the NGS would get a bit irate about prying the disk up to see if the chiseled cross is still there, we will have to accept that it is. This would be the same as having them set a disk is an old drill from the late 1800's. The station is still there so you get credit for both marks and the oldest in the county (after I verify that it is the oldest! ). Congratulations dirtfinder on your 100th benchmark find!!! (I was checking their finds for Mother's Day weekend and saw their note-cool). This contest was a great way to achieve that number....now on to your 200th! Is there anyone else that has achieved a milestone from logging in the contest?? If so - crow here!!! I think this is interesting to see some Geocachers getting out and getting some kind of milestone....like us...we found our first bolt and it has a cross with USBM on it!! Huh. I wasn't paying attention, and sailed right by my 100th mark also, just last month during the contest! Looks like it was DX3086, which is a pretty ugly one. Oh well. My next goal is more benchmarks than caches. Only 401 to go! Way to go Klemmer! Now for your number '200' - go for something really special....like some of the old marks along the Cal/NV border, an example is... T 140 - Drill Hole, Look at the pictures for this one. John says, if you are crazy enough...try 'VEX' - it has "Vexed" him enough for him to try 3 times to find a way up to recover it. The last time 4/25/06 - he went on top of the arch, but no luck going any farther...I was very glad that he decided not to try to go for it. Link for VEX. Thank you, it has been very fun for the whole famliy and we get to see more of Colorado than many other people. It has been tough keeping up with the two old farts (kinda wondering if they really are two old farts) and have been noticing that Me&Bucky has been around a time are two in these parts, again thank you and on to the 200th. Thanks, Shirley! Yes, those both sound like fun! I'm going to look seriously into getting out there. My daughter & son-in law are serious climbers, so I'll have an expert with me (son-in-law) for safety & advice. AND: I've GOT to get over there and log the VON SCHMIDT IRON POST (FS1100) for my 10 point bonus! The other counties nearby are either close to hopeless (LA, SD, Orange, Imperial) or I previously logged the oldest BM (Riverside). on his way to Page, AZ. I have over 100 finds also but can't seem to find time to go out and get anymore!!!! I am still in the ciontest but haven't found a BM in about 2 weeks. Hopefully this Sunday I can go snag a few more. I couldn't have picked a better one if I tried. It's the old style CSC&GS marking bolt from the 1903 triangulation of New York City, and as far as I can tell, the only surviving ground station from that survey (plenty of intersection stations still around). See this thread USC&GS old style bolt where we discussed that station. Harry Dolphin seems to have logged his 400th geocaching benchmark find at KV0677. Rather a bittersweet find, but he won't go into details on that. With any luck, Harry will realize that climbing railroad bridges is not the wisest thing to do. But the NJ Transit bridge over Meade Street in the Village of South Orange was a milestone, in more ways than one. He does seem to be running out of benchmarks to search for in his immediate area. Oh, well. I finally reached 1000 on that last journey. Wow! Congrats Geo and Mr. Dolphin!! If I have left out anyone else...please "Crow here!". I also want to thank Geo, for the 3 Benchmark coins that will be given to the 3 contest winners. That is awesome! We will soon be making an 'Official post' about the "Final" date to get all of your finds for the contest posted. Yup, the contest end is sneaking up! You better check and if you need just a point or two for the pin...or just want to up your score...now is the time! Please don't wait till the near end of the contest to post all your eligible logs. I want to get the final results posted in a most timely manner. Thanks!! BTW, great job by all those teams particiapting! There are impressive numbers being racked up here. Here's a question that this brings to mind. I hope to be on a trip at the end of the month and may not return till after July 31. Will there be a period after the official close of the contest that will allow us to log these? The dead line for logging your finds will be midnight, Sunday August 6th. If for some good reason you cannot get them all logged by then, you can PM us to see if we are in a good, kind & benevolent mood. I would like to take time and THANK everyone that has helped me out during the contest. I haven't been able to go for awhile now for the reason of the four letter word of WORK, I guess farmer are dire need of that organic nutrient and cant see that I needed time for my hobbies, But I have had a lot of fun and are excited about doing it all over again next time. Again THANK ALL OF YOU that have been such a big help. This rookie would be dead last if it weren't for some help with probably some pretty stupid questions so I can't say it enough THANKS to ALL. Thanks for joining the contest and showing how well a "Newbie" can do! Hope you will get into the next contest as well. FYI...I think after tomorrow, I may be able to offer a "fourth" prize, similar to the third prize. Would there be any interest? In answer to 4leafclover about a 'real benchmark' that has been taken out of service by an official agency and is now offered to one of the contestants...yes! The following is a quote that I sent to 4leaf and she agreed that this would be fun. "We have had a light bulb go on over our heads...what would you think about a drawing of all the contestants who had points? The person who was drawn would receive this "4th" prize. That way anyone who has actually done any footwork (so to speak) to find any marks could have a chance at this." She just has to get the concrete off of it so the shipping will not be astronomical. So, if you have any points at all...even one...your name will be thrown into a hat for this 4th prize! Neat huh?? The contest has drawn to a close. It has been a great contest with many "Oldest In The County" benchmarks being found. It is amazing how many benchmarks 70 years old and older were recovered in good condition. Congratulation to all who got their 20 points to get their free pins from stvanme. Thanks stvanme for getting them for the contestants! We also thank GEO*Trailblazer 1 for providing the benchmark coins for the top 3 placers. 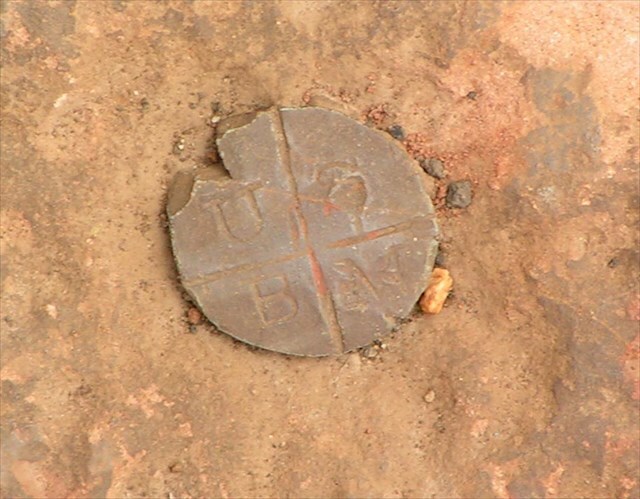 4leafclover has the benchmark disk removed from the concrete and has indicated that a drawing of a name of 1 of the contestants will determine who gets it. Thank you for donating your benchmark disk. The biggest thanks goes to AstroD-Team for being the scorekeeper. This allowed us, the 2oldfarts the opportunity to participate in the contest. She verified every find that was logged & when there was a problem with the find she MADE me send the PMs! Actually she informed us of the problem and we verified her decision and then sent the PMs. Thanks AstroD-Team (both of you) for doing the hard part of keeping thing straight and posting a running tally for all to watch. Finding the benchmarks is over, you have until midnight 8/06/2006 to get you finds logged and posted. Thanks to all who were a part of this contest & we hope you had as much fun as we did! I also wish to say THANK YOU to stvanme, GEO*Trailblazer 1, and 4leafclover for the prizes you've supplied. A VERY BIG THANK YOU to AstroD-Team for score keeping and 2 Old Farts for putting the contest together. Ditto! It's been a blast - it was great knowing that I wasn't the only person driving around 100 miles from home, kicking thru dirt + it kept me motivated to keep hunting instead of doing usless things like putting up shelves & cleaning out the garage! PS - I'm afraid that for the NEXT contest, I'll need a plane ticket & a rental car to get to new hunting grounds! Well I hope it is when it cools off some. I already have a big list for the next one. i hope it is around vacation time again. If not I will need a plane too. If I only had a helicopter!! I've been to nineteen counties in seven states! I've probably looked for sixty percent of the old benchmarks in north Jersey. (Or within 35 miles) I'm mighty afeared of the next contest! Thanks to all, and especially the 2oldfarts for the challenge. I've gotta say I'm impressed. Hate to see your gas bill! I did mine on Vacation. And a rent a car. I still would like to borrow a helicopter from one of ya. Got the plans for a 2 man but don't have the cash. It will just have to be a long hike one of these days. Thanks 2 old farts for organizing this contest! It's been fun! I appreciate you taking on the burden of sending those dreaded PMs to the contestants! It's nice to know I can still wiggle my way outta unpleasant things. Oh, I hope that eye strain you received is now aleved. Thanks Stvanme for taking the time to come up with the contest pin. You have been very generous with your talents and money shipping them out. It will be a pin that will be treasured. Thanks Geo TrailBlazer1 and 4 leafclover for some great prizes for the contestants! Awesome prizes for some top notch hunters indeed. Lastly, thank you to all the particiapnts! Checking all the logs, I got to go BMing outside of Wisconsin, see some of our fantastic country, and meet some truly dedicated hunters. It doesn't get much better than that. You've all been great! Thanks!!! !